Since I've been commuting from my hometown to Chicago for my new job, I've had to adjust to a new routine. When I first started, I was always hungry. Because I was getting up earlier, my breakfasts weren't keeping me full until lunch. I would be starving when it was time to eat lunch and then by 4pm I would be hungry again. At the moment my commute is an hour and 15 minutes each way. What I've been doing is eating half a breakfast before leaving (like a yogurt or some cereal) and then bringing some fruit to have at work to tide me over until lunch. I also have a healthy snack drawer at work with some nut bars and applesauce in case I get the afternoon munchies. I've found that on days when I work out in the morning I'm starving when I get to work and some fruit just won't cut it. 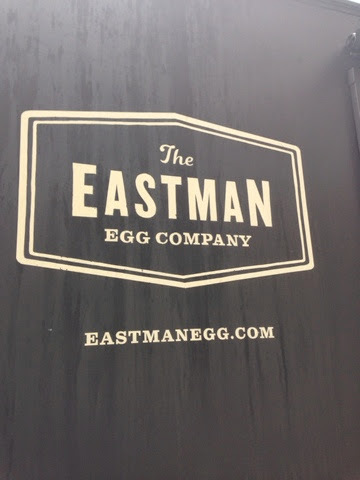 Recently, my dad recommended Eastman Egg Co., a food truck that parks a few block from the train station some mornings downtown. I decided later that week I would reward myself for getting up at 5:30am to work out with a lovely egg sandwich. Well, I tried it and I'm in love. 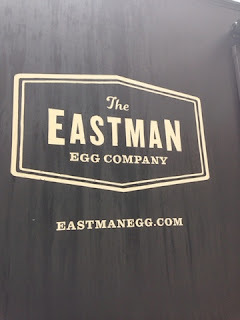 Eastman Egg has several unique sandwiches using fresh ingredients. 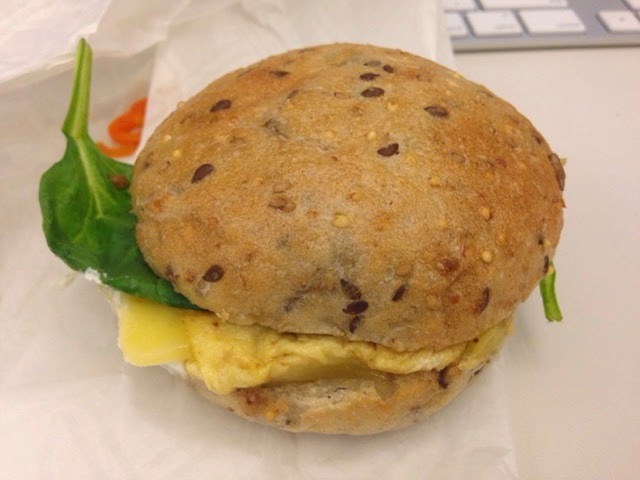 I ordered "The Fairfax" which had scrambled egg, Egmont cheese, sautéed bell pepper, wilted spinach, a House Green Goddess sauce all on a 7 grain roll. All these ingredients came together to make a healthy and filling breakfast for me post-workout. I also had a cup of their Sparrow coffee which was divine. I'm just getting in to the food truck scene in Chicago, but I already know which one will be my favorite breakfast truck.